From Eastbourne in East Sussex, UK, they were founded in 2001 to perform at the Eastbourne Lammas Festival. They have gone from strength to strength since then and will play at the smallest of events to the largest of festivals. They perform at over 40 events a year all over the UK and still perform at Eastbourne Lammas Festival to this day. 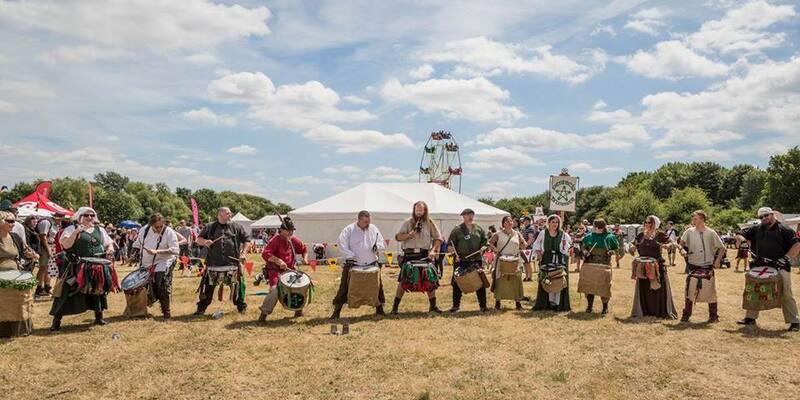 The Pentacle Drummers main livery is the green and red tatter coats and matching facepaint. They also adopt medieval style attire for several medieval events , including England’s medieval festival at Herstmonceux and Tewksbury medieval festival. For the Sussex bonfires (including the famous Lewes bonfire celebrations) they adopt a slightly darker look in keeping with the feel of those events. Their aim is to be colourful, energetic and to entertain.